My middle daughter is playing soccer this year. With games pretty much every Sunday this is affording me a nice opportunity to do a little drone flying and practicing. The good thing about this is the variety of new ovals and thus new locations we are visiting. I shoot the games for the families of the girls and provide a web gallery of images for them each week. Truth be told it gives me a reason to make some use my long lenses. That big and heavy (but surprisingly sharp) Sigma 50-500mm lens along with the spectacularly nice Nikon 70-200/2.8. I usually take my DJI Phantom 4 along with us, and sometimes it ends up being a location I can fire up the drone. If even for a relatively low flight over some clear open space. Either before (as in this case) during or after the game. I’m typically pretty careful with the drone and keep it away from people and buildings and don’t fly over crowds (or the games). Sydney thankfully has quite a lot of open space, especially around the ovals, parks and waterways. 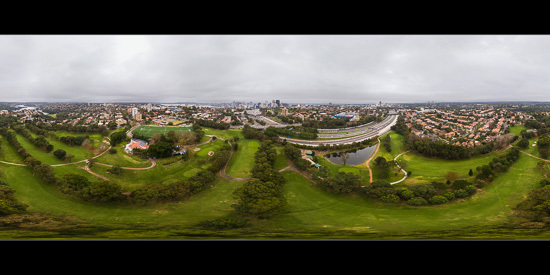 I’ve been experimenting with doing full 360˚ panoramas with the drone lately. So here is another one taken at Cammeray on Sydney’s north shore. See a birds eye from 60m up and get an interactive view of the scene. You can control the view and look around the scene using your mouse or keyboard (e.g. arrow keys). From here we can see all the way down to the harbour and the Sydney CBD on the other side in the distance. I reckon even this flattened equirectangular projection view of the whole space looks pretty good. Sometimes the complete panorama doesn’t look very good at all.